I’d never really had an issue with halloween as a kid as it wasn’t a big thing amongst friends or even in shops back then(and I’m only 30!). The issue only cropped up a couple of years ago when a church friend who shares with non-christians invited me to a party. I said yes, and it was only my husband who suggested it might be worth thinking about. In the end I decided that being at the party to support my friend and socialise with her flat mates was the right thing to to, However, I did team up with some other church girls and go as the “Ghost Busters” as a bit of a nod to not appreciating the celebration of it. I’m not sure if it really worked as of course you are really thorough about it, then there’s issues with the fact that ghost buster trivialises the matter. Hi Gill. 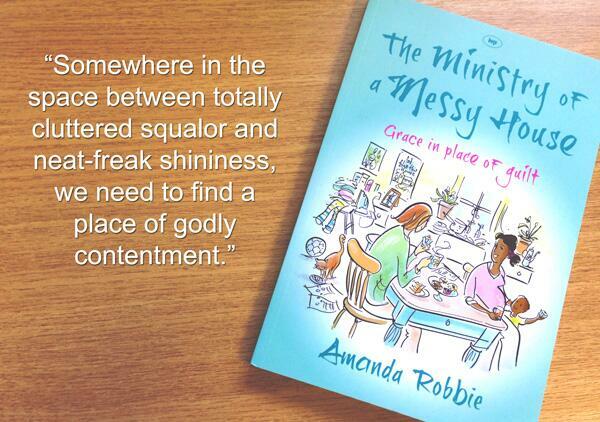 The video over at the Urban Pastor is very helpful – thanks! Love the cartoon! Personally, I like the ‘lights party’ idea as the best response a Christian can have to hallowe’en. I don’t want to look like I’m passing judgement and spoiling everyone’s fun. I think Squidge managed to answer the door last year and announced, in her high-pitched squeak, “Sorreee! We don’t do hallowe’en!” and slammed the door in their face. Which is another way of tackling an issue. Get yourself a Squidge. Ha! Light parties are a great idea but it’s hard to cover all nights – yesterday a Twitter friend was bemoaning a Halloween school disco that’s happening on Thursday evening, scuppering all their plans for being unavailable due to the church light party! I am #1 all the way. Not all Christians see Halloween as a ‘tragedy’. I grew up in a Vicarage and my siblings and I always enjoyed dressing up and playing games at this time. My sister’s birthday is close to Halloween so she would often have Halloween-themed parties. This is the time of year when we’re forced to confront our fears about darkness, the unknown, and death. For Christians, Halloween is followed immediately by the Feast of All Saints – when we look to Heaven and rejoice in those who have given their lives to God in exemplary ways, and then by the Feast of All Souls, when we pray for all those who have died. Christian culture has often incorporated elements we might consider more ‘pagan’ – such as the Christmas tree. Do you object to Christmas trees as well? Are your children allowed to read books with ghosts/witches, such as the Harry Potter series? Hi Lucy and thanks for commenting. I’m not sure I see Halloween as a tragedy myself – I was making a link with J John’s post in a tweet! Although J John’s post on that is very interesting and thought provoking – he notes some ways in which a celebration of Halloween trivialises evil http://www.philotrust.com/blog/2012/10/the-tragedy-of-halloween#.UI_sJmeOJnT . Since Halloween is becoming a much larger festival in the UK now, Christians need to think about what they are ready to celebrate – light over darkness – and what is too much of the dark for us to indulge in. Personally, I’d not hold a Halloween party rather than a light party and I tend not to shove Gothic themed books and vampire and ghost stories in my kids’ paths as there are plenty of other things out there to read. But as you point out, Christians have redeemed pagan festivals for hundreds of years. We’re now thinking through how to redeem this one. Do you have any limits about what you’d partake in or give to children? I like the idea of light parties – I suppose they already exist in various manifestations during the winter months – e.g. the Swedish tradition of big celebrations on the feast of St Lucy (13th December), which we also enjoyed in the Vicarage when I was small. I don’t find the gothic inherently problematic, and in deciding where to set limits with the children I hope I will have one day, I think I will be more concerned about the message than the medium. I’d be very happy for them to read the Harry Potter books, because they’re fundamentally about the redeeming power of love, and teach lots of other good morals along the way, about friendship, forgiveness, etc; but I would be uncomfortable about them reading the Twilight series, because at their core those books model a very unhealthy, manipulative relationship. The gothic setting of Twilight (vampires and werewolves) is incidental. Thanks for using the toon – I know you asked but it’s nice to say thanks I think. Sorry that it doesn’t offer any positive alternatives. I’m not sure there are any really. I think my main objection with Hallowe’en is again nobody seems to give much thought to what they are encouraging children to do. Trick or Treating for example would be frowned upon as demanding sweets with menaces at any other time of year. I’d like my role as a Christian here to be more one of asking the pertinent question than shouting from a soapbox. I certainly would describe myself more of a number 3 than anything but in recent years we’ve ended up with something akin to number 2. Hi Crimperman. We try to discourage the demand for sweeties with menaces by insisting on the Scottish Halloween tradition of guising – we make them tell a joke or sing a song before we reward them with a treat – more like carol singers. 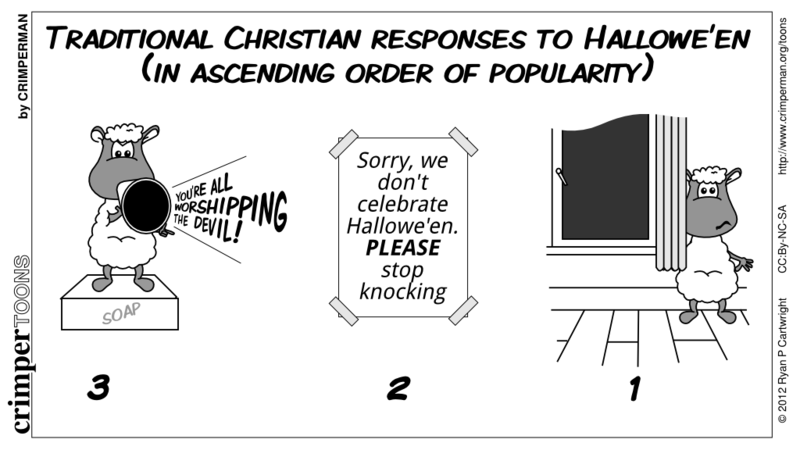 But the Halloween bandwagon is getting larger and harder to avoid every year so we feel that the best thing to do in our context is to put it to some gospel use when neighbours call. We’ve just spent the early evening ignoring those knocks on the front door, and glad to find nothing unpleasant through the letter box….And we know very few local children, so were surprised that so many people knocked – hope they had adults with them as they knocked on the doors of strangers. And no, our house is not labelled ‘The Vicarage’.